What is Building Automation (Temperature controls, energy management)? This article is about automation within commercial buildings. Building automation describes the functionality provided by the control system of a building. A building automation system (BAS) is an example of a distributed control system. The control system is a computerized, intelligent network of electronic devices, designed to monitor and control the mechanical and lighting systems in a building. BAS core functionality keeps the building climate within a specified range, provides lighting based on an occupancy schedule, and monitors system performance and device failures and provides email and/or text notifications to building engineering staff. The BAS functionality reduces building energy and maintenance costs when compared to a non-controlled building. A building controlled by a BAS is often referred to as an intelligent building system. 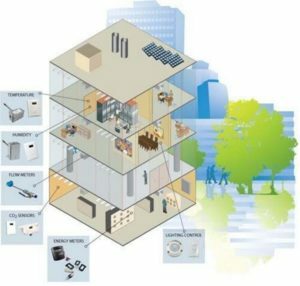 Proprietary – Most building automation networks consist of a primary and secondary bus which connect high-level controllers (generally specialized for building automation, but may be generic programmable logic controllers) with lower-level controllers, input/output devices and a user interface (also known as a human interface device). The primary and secondary bus can be BACnet, optical fiber, Ethernet, ARCNET, RS-232, RS-485 or a wireless network.Most controllers are proprietary. Each company has its own controllers for specific applications. Some are designed with limited controls: for example, a simple Packaged Roof Top Unit. Open Protocol – Others are designed to be flexible. Most have proprietary software that will work with ASHRAE’s BACnet or the proprietary LonTalk. Inputs and outputs are either analog or digital (some companies say binary). Analog inputs are used to read a variable measurement. Examples are temperature, humidity and pressure sensor which could be thermistor, 4-20 mA, 0-10 volt or platinum resistance thermometer (resistance temperature detector), or wireless sensors. A digital input indicates if a device is turned on or not. Some examples of a digital input would be a 24VDC/AC signal, an air flow switch, or a volt-free relay contact. Digital outputs are used to open and close relays and switches. An example would be to turn on the parking lot lights when a photocell indicates it is dark outside. Analog outputs control the speed or position of a device, such as a variable frequency drive, a I-P (current to pneumatics) transducer, or a valve or damper actuator. An example is a hot water valve opening up 25% to maintain a set-point. Controllers are essentially small, purpose-built computers with input and output capabilities. These controllers come in a range of sizes and capabilities to control devices commonly found in buildings, and to control sub-networks of controllers. Inputs allow a controller to read temperatures, humidity, pressure, current flow, air flow, and other essential factors. The outputs allow the controller to send command and control signals to slave devices, and to other parts of the system. Inputs and outputs can be either digital or analog. Controllers used for building automation can be grouped in 3 categories. Programmable Logic Controllers (PLCs), System/Network controllers, and Terminal Unit controllers. However an additional device can also exist in order to integrate 3rd party systems (i.e. a stand-alone AC system) into a central Building automation system). PLC’s provide the most responsiveness and processing power, but at a unit cost typically 2 to 3 times that of a System/Network controller intended for BAS applications. Terminal Unit controllers are usually the least expensive and least powerful. PLC’s may be used to automate high-end applications such as clean rooms or hospitals where the cost of the controllers is a lesser concern. In office buildings, supermarkets, malls, and other common automated buildings the systems will use System/Network controllers rather than PLC’s. Most System controllers provide general purpose feedback loops, as well as digital circuits, but lack the millisecond response time that PLC’s provide. 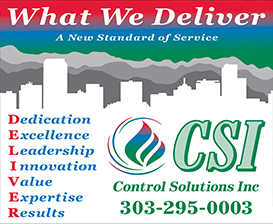 System/Network controllers may be applied to control one or more mechanical systems such as an Air Handler Unit (AHU), boiler, chiller, etc., or they may supervise a sub-network of controllers. In the diagram above, System/Network controllers are often used in place of PLCs. Terminal Unit controllers usually are suited for control of lighting and/or simpler devices such as a package rooftop unit, heat pump, VAV box, or fan coil, etc. The installer typically selects 1 of the available pre-programmed personalities best suited to the device to be controlled, and does not have to create new control logic. DDC is the automated control of a condition or process by a digital device (computer). A very early example of a DDC system meeting the above requirements was completed by the Australian business Midac in 1981-1982 using R-Tec Australian designed hardware. The system installed at the University of Melbourne used a serial communications network, connecting campus buildings back to a control room “front end” system in the basement of the Old Geology building. Each remote or Satellite Intelligence Unit (SIU) ran 2 Z80 microprocessors whilst the front end ran 11 in a Parallel Processing configuration with paged common memory. The z80 microprocessors shared the load by passing tasks to each other via the common memory and the communications network. This was possibly the first successful implementation of a distributed processing direct digital control system. Central controllers and most terminal unit controllers are programmable, meaning the direct digital control program code may be customized for the intended use. The program features include time schedules, set-points, controllers, logic, timers, trend logs, and alarms. The unit controllers typically have analog and digital inputs that allow measurement of the variable (temperature, humidity, or pressure) and analog and digital outputs for control of the medium (hot/cold water and/or steam). Digital inputs are typically (dry) contacts from a control device, and analog inputs are typically a voltage or current measurement from a variable (temperature, humidity, velocity, or pressure) sensing device. Digital outputs are typically relay contacts used to start and stop equipment, and analog outputs are typically voltage or current signals to control the movement of the medium (air/water/steam) control devices. Usually abbreviated as “DDC”. When DDC controllers are networked together they can share information through a data bus. The control system may speak ‘proprietary’ or ‘open protocol’ language to communicate on the data bus. Examples of open protocol language are BACnet (Building Automation Control Network), LON (Echelon), Modbus. When different DDC data networks are linked together they can be controlled from a shared platform. This platform can then share information from one language to another. For example, a LON controller could share a temperature value with a BACnet controller. The integration platform can not only make information shareable, but can interact with all the devices. Most of the integration platforms are either a PC or a network appliance. In many cases, the HMI (human machine interface) or SCADA (Supervisory Control and Data Acquisition) are part of it. Integration platform examples, to name only a few, are the Tridium Niagara AX, Johnson FX40, TAC Vista and the Unified Architecture i.e OPC (Open Connectivity) server technology used when direct connectivity is not possible. DDC is often used to control HVAC (heating, ventilating, and air conditioning) devices such as valves via microprocessors using software to perform the control logic. Such systems receive analog and digital inputs from the sensors and devices installed in the HVAC system and, according to the control logic, provide analog or digital outputs to control the HVAC system devices. These systems may be mated with a software package that graphically allows operators to monitor, control, alarm and diagnose building equipment remotely.